An array of 575 solar panels covers the roof of the Bullitt Center, a role model for a new generation of sustainable, energy-efficient buildings. In cloudy, drizzly Seattle, Denis Hayes, the environmental activist who organized the first Earth Day in 1970, is pulling the wraps off a six-story office building that generates all of its electricity via an oversized rooftop array of solar panels. 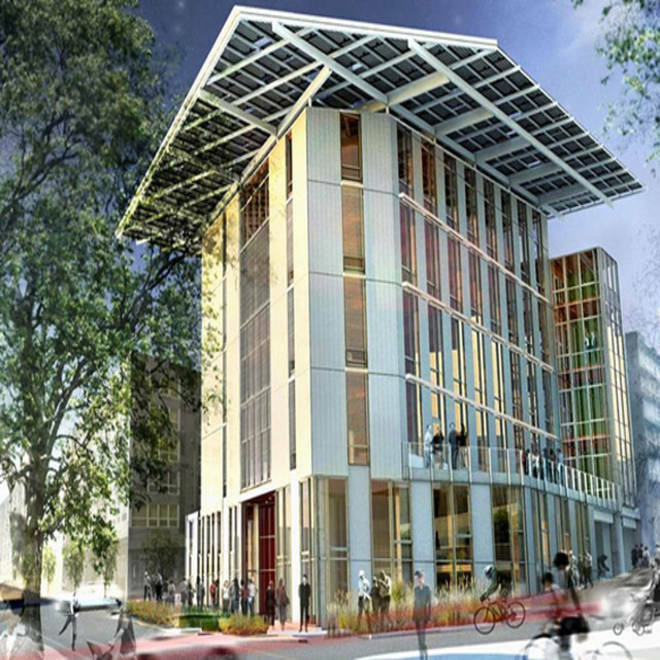 A sun-powered building in Seattle is "formidable," Hayes told NBC News, but the Bullitt Center project aims to show it is possible in a visible, tangible manner that, in turn, makes an impact on the often invisible, slow-motion challenge of global climate change. "When this whole [Earth Day] thing got launched in 1970, we had people walking around with gas masks and smokestacks were pouring out enormous impenetrable clouds of black smoke," said Hayes, who is now president of the Bullitt Foundation, which supports environmental causes. Today, the sooty smokestacks and black clouds are largely gone, but our energy demands have never been greater, and the impacts of climate change are considered by environmental advocates to be more and more apparent, ranging from extreme weather to growing food insecurity. As scientists toil to identify how our world is changing, the environmental movement will have to spend the next decades finding better ways to rally the world's citizens to address the new challenges. Hayes says the Bullitt Center addresses many of the environmental issues underpinned by global climate change. Take, for example, the building's 56,000-gallon basement cistern for storing captured rainwater. It's a seemingly odd fixture for a building in a city famous for its rain and amply supplied by water, stored in snow form, from the nearby Cascade Mountains. The Bullitt Foundation, whose mission is to safeguard the environment, spent $18.5 million to construct this uniquely sustainable office building. "There is not going to be enough water in the future," Hayes said. "There is going to be far less snowpack. The water is going to come in gushers and there is just no way to build additional reservoirs to capture it in the Cascades." Hayes, who co-founded Earth Day with Gaylord Nelson, now heads the Seattle-based Bullitt Foundation. The solution? Build thousands of reservoirs in the basements of buildings, sufficient to hold water to meet the needs of the current and future residents of a city that studies suggest could grow by at least a million people in the next few decades — potentially, many climate refugees from the parched Southwest, noted Hayes. The hope is that "by trying to build a building as best we could, that literally does everything right," the Bullitt Center will drive change in the building industry with the type of impact Tom's of Maine, a green personal care products company, had on Proctor and Gamble, an industry giant, Hayes said. Given that buildings in the U.S. account for 39 percent of the nation's carbon dioxide emissions, 65 percent of waste and 70 percent electrical use, adoption of the Living Building Challenge standards highlighted by the Bullitt Center could make life on Earth more sustainable by the middle of this century. "If we can get a whole bunch of these other buildings built and we start eating up that market share, then we can begin to have changes that are not small incremental one inch here, five inches there, but a fairly profound impact," he explained. "At least, that's the theory." Want to know more about the Bullitt Center? Read our feature story here, and check out our slideshow. But even if self-sustainable architecture really takes off, it can't solve all the environmental issues, Hayes noted. In particular, he worries about food security, at a time when rising prosperity around the world means a shift to more meat-heavy diets. The shift in diet is not the only issue, either. It may be hard enough to meet the basic needs of a hungry population, according to Lester Brown, founder and president of the Earth Policy Institute and a leading thinker on global environmental issues. "Agriculture as it exists today has evolved over an 11,000-year period of rather remarkable climate stability," he told NBC News. "If the climate system begins to change, suddenly the climate system and the agricultural system will no longer be in sync with each other. With each passing year, they will be more and more out of sync, making it difficult to just maintain production, much less to increase it." The solution, Brown added, would be to escalate the problem from the agriculture departments and ministries up to the very heads of state, who will need to grasp food's relationship to everything from energy policy to shifts in population. And in turn, world leaders need to work together. "No one country can ensure food security on its own because we are talking about climate change being one of the keys here and that requires a global effort," Brown explained. "No country can stabilize its climate unilaterally; it takes a concerted international effort." Building an international coalition to tackle global climate change is plausible, and happening, leading environmental scientists said Thursday during a panel discussion with recipients of the Tyler Prize, an environmental achievement award, at the National Press Club in Washington, D.C.
For example, John Holdren, director of the White House Office of Science and Technology and a Tyler Prize laureate in 2000, said that in both India and China "the leadership is fully aware of the damage already being done to their countries by climate change and they are fully aware that ultimately the problem cannot be solved without their participation." That participation, he added, is already underway, as exhibited by a Joint U.S.-China Statement on Climate Change posted on the Department of State's website earlier this month. "Forceful, nationally appropriate action by the United States and China — including large-scale cooperative action — is more critical than ever," reads the statement. "Such action is crucial both to contain climate change and to set the kind of powerful example that can inspire the world." Only time will tell if the statement is truly the beginning of something focused and concrete that puts the world on the path to tackling the biggest environmental issues of today and tomorrow. Meanwhile, Hayes, on the 43rd anniversary of the first Earth Day rally, readies his new self-sustaining office building for the world to see, as he continues to search for ways to raise awareness about the environment. "Somehow we have to take all of these issues — and I don't have the magic formula — and make them the most immediate concern," he said. "And I guess the reason for optimism is that sometimes stuff just happens. It is almost like a school of fish — it is a biological phenomenon."